On Thursday, July 24, Cusp Dining & Drinks will celebrate the sounds of jazz, blues and Latin music by the John Cain Jazz Trio for Cusp's July Supper Club. The trio’s mix of contemporary and classic jazz, blues and standards music will complement Chef Donald Lockhart’s Mediterranean-inspired cuisine in both sophistication and style for an exciting 4 course dining experience. Inspired by the trio’s music, Chef Lockhart has created a jazzy four-course prix fixe dinner that includes an amuse of Heirloom Tomato Hummus with spicy feta and cucumber pea sprout salad. Guests can pick from starters like Skillet Brioche Bruschetta with fried egg, mushrooms and watercress, and entrees like Cast Iron Roasted Corvina Sea Bass with white corn risotto, lemon pesto and spring vegetable salad. Head Bartender Chris Burkett will also offer cocktails off of his new menu like the bubbly Agent Smith made with Prosecco and classic cocktails that can be enjoyed at the bar or as part of the meal. The Supper Club with the John Cain Jazz Trio is $50/per person, which includes dinner and live music. Reservations can be made by calling 858-551-3620. Music will play from 6:30 - 9:30pm. Reserve early, and get ready to paint the town again on Aug. 28 with the Danny Green Trio and another specially conceived dinner menu. 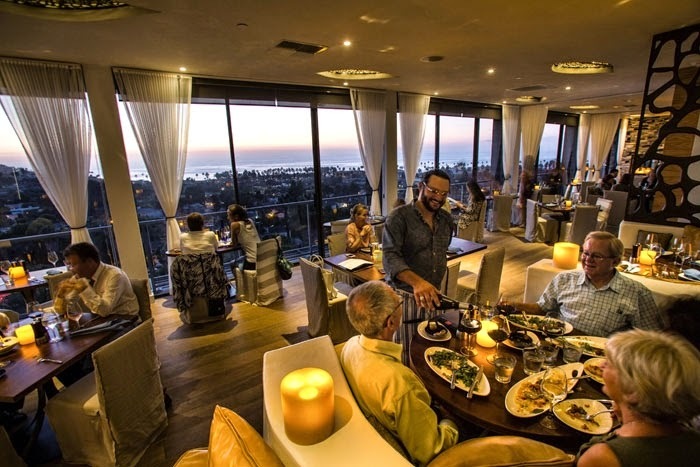 Cusp Dining & Drinks is located at Hotel La Jolla at 7955 La Jolla Shores Dr. For more information, call 858-551-3620 or visit Cusp online at cusprestaurant.com.